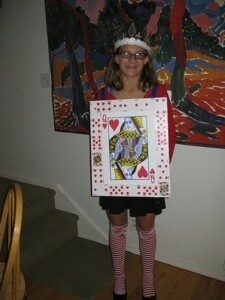 Creative, crafty and inexpensive Halloween costume! Could not have cost more than $10 per person for all. My son and his friends decided they wanted to be playing cards for Halloween. Here is how we made it happen. Nylon belt straps or wide strip of elastic or material, to staple to tops of boards for shoulder straps. Cut foam core pieces to measure 16x20 inches each person needs two boards, one for front of card image. one for back. Enlarge front and back of playing card at local copy shop. We used Kinkos, and enlarged each individual card up to 11x16, the highest we could go for copyright issues. Then, centered the image on sticky side of foam board. Use spare cards to decorate the sides. The girls (as seen in photo) decorated foam crowns with glitter glue. Source: the crafty creative kids who will be wearing them, and the moms that made it work.